Fan-made Battlefield 3 GTA V parody shows the trailer in a whole new light. While we all sit around twiddling our thumbs waiting for Rockstar to release some new information - and preferrably a release date - for Grand Theft Auto V, it's inevitable that time and space are both going to be taken up by opportunistic souls intent on channeling some of the interest in GTA V to their own benefits. Some will push rumours, some will write preview features cobbling together the relatively meager information we have so far and some might even accidentally stumble across some real information in their speculation - that's just the nature of the game, and complaining about anything dedicated to GTA V before the developer releases new material is little more than folly. To paraphrase Dr Ian Malcolm from Jurassic Park "GTA V... ah... finds a way." And the video below is one of the finest moments of this pre-release period, a bright spark in the vacuum of information devoted to the game that is enormously good fun, and admirably executed in equal parts. 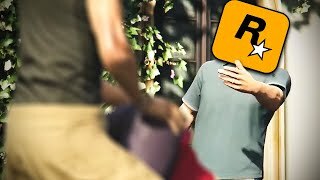 A Youtube genius by the name of Ketgano15 has pain-stakingly cut together a new version of the GTA V trailer, voice-over and all using Battlefield 3, shot-matching often with hilarious results (see the golf swing moment on 16 seconds), to create a very funny parody trailer for the game. I particularly like the painful looking shuffle-walk the soldiers do... http://youtu.be/4CT40ldjItA See now, this is exactly why the lack of GTA V news is a good thing (more of which later) - it makes the community create their own hype and in certain cases, their own material like this. And that can't be a bad thing. It becomes even more of a thing of joy once you watch the two trailers side by side, and see exactly how much work has gone into matching the shots... http://youtu.be/RVzyLzll4NA Mighty fine work.